Boating allows residents to enjoy the environment, but many boats, especially high-speed motorized watercraft--can harmfully impact the environment. There are many ways boaters can mitigate their environmental impacts simply by taking personal responsibility including, cleaning their vessels to prevent aquatic hitchhikers such as zebra mussels and Eurasian water milfoil, keeping wakes to a minimum near shore to stall erosion, and by taking care to dispose of trash, excess fuel, and other chemicals properly. Dr. Latimore, Aquatic Ecologist, Department of Fisheries and Wildlife, Michigan State University, heads up the Clean Boats, Clean Water program for Michigan, which aims to prevent the spread of zebra mussels and other aquatic invaders. 2. Maintain Proper Equipment Be sure your engine reaches its correct wide-open-throttle RPM by choosing a prop with the right pitch. Adjustable-pitch propellers and modular props help your boat run efficiently and ultimately reduce fuel consumption. Make sure your boat, engine and propeller blades are in good condition to avoid wasting fuel and minimize the chance of oil, gasoline or other hazardous materials entering the water. 3. Recycle Your Waste Dispose of paints, batteries, antifreeze, cleaning products, oil and other hazardous wastes at a waste collection facility when you return to land. Never discharge your sewage when you are near the shore; for proper waste disposal, always use authorized pump-out stations or shore-side facilities. Check local rules and regulations for specific restrictions. 4. Maintain a Clean Bilge Keep your engine properly maintained and tuned to prevent fuel and oil leaks into the bilge. Use an oil-absorbent pad in your bilge and under the engine where drips can happen. Your regular boat maintenance routine should include bilge cleaning; consider using a bioremediation product to convert hydrocarbons into safe compounds. 5. Prevent Fuel Spills Use or install a device to prevent overboard discharges from your tank vent. Such products will give warning and work to prevent spills when your tank is reaching its fuel capacity. Fill your tank slowly and leave it 10% empty to prevent overflows and give the fuel room to expand as it warms. 6. Chart Your Course Study waterways to prevent boat propellers from damaging sensitive sea floor habitats or injuring marine life. Plan your trip in advance to avoid confusion and misdirection which lead to excess fuel usage. Use an autopilot, which can steer better than most captains and maintain a longer attention span. 7. Recycle Your Monofilament Fishing Line Discarded fishing line is hazardous: It can entangle and kill marine birds and wildlife, and get caught in boat propellers and gear, resulting in potentially costly damage. Protect marine life and your fellow boaters by properly disposing of your monofilament fishing line. Many bait and tackle shops, marinas, fishing piers, marine accessories stores and boat ramps have monofilament recycling bins. A number of states have monofilament recycling initiatives; check with your state’s conservation or natural resources department. 8. Stow Your Trash Keep your trash onboard: never throw cigarette butts, fishing line, or any other garbage into the ocean. Take advantage of shore-side facilities to recycle plastic, glass, metal and paper. Recycle your winter storage shrink-wrap at local marinas, dealers and suppliers. If a boat has an engine, it has a carbon footprint. Your boat's carbon footprint is directly proportional to how much gas it burns a year (boating season). One gallon of gasoline is equal to about 20 pounds of CO2 (actually 19.564 pounds). Some environmental purists would argue that since recreational boating is frivolous by definition, then perhaps the most environmentally responsible thing to do is sail or paddle rather than speed across the waves. However, boaters also have a unique opportunity to observe and enjoy the aquatic environment, and not everyone has all day to paddle miles down the river or sail across the lake. Motorized watercraft can be a useful way to enjoy the water when time is short. * Pull the throttle back from WOT (wide open throttle) to Cruise at least twice more per boat outing. * Lighten up your boat. Go over it with a fine tooth comb before the season and throw out everything you don't really need. Then do it a again at least once a month during the boating season. Excess weight drastically effects fuel consumption. 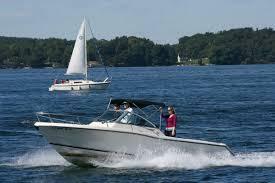 * When buying a new or used boat, make sure the engine is properly sized and one of the new more efficient models. * Do not buy a carburated motor. They are much less efficient than the newer generation motors. * Get on plane quickly with planing boats. Don't keep slugging through the water with high resistance when the hull is fully in the water (except in no wake zones, manatee zones, or other posted areas). * Install an electronic fuel meter if you do not have one. Use it to monitor fuel consumption and establish your optimum cruise speed. * Follow the engine manufacturer's recommended maintenance schedule. * Invite some friends to go boating with you (just like carpooling, more people to split the emissions among - others are able to participate in the boating experience without adding more carbon dioxide to the atmosphere). * If you have a larger boat making longer runs, consider installing an autopilot. Keeping closer on course will save fuel. * If "speed" is your thing, get a smaller boat. Smaller boats can go much faster on less fuel. * Consider a pontoon boat. They offer a lot of space and fishing opportunities and generally don't burn a lot of fuel. Michigan is one the most popular states in the nation for recreational boating, with more over 1300 public boating access sites and over 80 harbors and marinas. There are more than 11,000 inland lakes and 36,000 mile of rivers and streams. Michigan’s Clean Boats, Clean Waters program is funded by Michigan Sea Grant to help prevent the spread of AIS. Volunteers are trained to inspect and clean watercraft properly, and they are stationed at boat launches throughout Michigan where they teach boaters what to look for and how to clean. Aquatic invasive species have long been recognized as a serious threat to the United States. According to Cornell University research, introduced species of animals, plants and microbes cost the U.S. economy at least $148 billion a year. Invasive aquatic plants and animals jeopardize the future of Michigan waters. With the arrival of aquatic invasive species, volunteers are needed now more than ever to help preserve and protect Michigan waters. Dozens of organizations, hundreds of teachers and thousands of students have participated in the Purple Loosestrife Project, inoculating infested Michigan wetlands with Galerucella beetles. Native plants have now returned to many of these wetlands. Fishing enthusiasts have joined Michigan’s Angler Monitoring Network, reporting invasive species they find in the state’s waters. Alert Michigan citizens have helped track the spread of zebra mussels to more than 200 inland lakes. Communities across Michigan have hosted training workshops where participants learn about the ecological damage caused by aquatic invasive species in Michigan — plants such as Eurasian watermilfoil, fish such as round gobies, animals such as zebra mussels and microscopic zooplankton such as water fleas — all of which can disrupt aquatic ecosystems. 1. Remove any visible mud, plants, fish or animals before transporting equipment. 2. Drain water from equipment (boat, motor, trailer, live wells) before transporting. 3. Clean and dry anything that comes into contact with water (equipment, clothing, dogs, etc.). Michigan law prohibits placing a boat, trailer, or equipment in the water with plant material attached, as well as possessing or transporting several live non-native fish. Never release plants, fish or animals into a body of water unless they came out of that body of water. 89.1 WEMU's David Fair discusses environmentally sound boating with Michigan State University Aquatic Ecologist, Dr. Jo Latimore.